Our sweet almond oil (Prunus amygdalus var. dulcis) contains a unique fatty acid balance combining the stability of monounsaturated fatty acids (MUFA) with enough polyunsaturated fatty acids (PUFA) to absorb quickly. Whether you’re applying it to your face or body, its therapeutic qualities leave your skin feeling hydrated and nourished and its after-feel is light and silky — never greasy. From being the backbone of an emulsification in a formulation, to the preferred choice of massage professionals in its neat form, formulators agree that it’s extremely versatile. Time and time again, sweet almond oil proves itself to be an essential ingredient to reinforce what premium health and beauty products offer: softer skin, healthier hair, and more luxurious cosmetics. 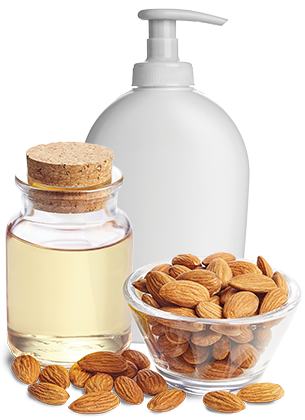 Since before the time of ancient Rome, sweet almond oil has been sourced as an effective moisturizer and beauty treatment. 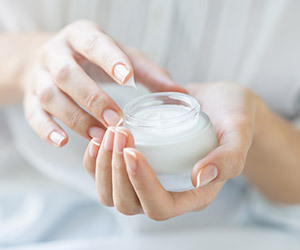 Today, the same rich, therapeutic emollient qualities that have softened skin and conditioned hair over the centuries continue to add value to health and beauty products. We include sterol testing as a marker of our 100% pure almond oil. No blending with low cost cooking oils. Just pure oil pressed from ripe, shell-free almonds grown in the orchards of our California farmers. For more than a hundred years, Blue Diamond has been an almond growers’ cooperative whose business is California almonds. We know this crop and we know this business. Our growers nurture their trees through bloom to harvest. The end product reflects the expertise of Blue Diamond’s member-growers who have worked the rich soils of central and northern California for generations. For the first time, we are offering sweet almond oil, 100% pure — never blended. To learn how Blue Diamond’s pure sweet almond oil can elevate your health and beauty products, please fill out the form below. © 2019 BLUE DIAMOND GLOBAL INGREDIENTS DIVISION.